Last November, Uzbek-based Artel Group gave a tour of its new collector and tank production facility in the capitel city Tashkent. It houses the manufacturing lines for selectively coated and laser-welded collectors traded under the brand name Royal. Stainless steel tanks insulated with polyurethane foam and holding between 300 and 1,000 litres complement the business’s product portfolio. Turkish manufacturer Solimpeks has been advising the company on design matters since 2016. According to gazeta.uz, a website by Uzbekistan’s public relations department, the factory had been inaugurated on 13 November last year. 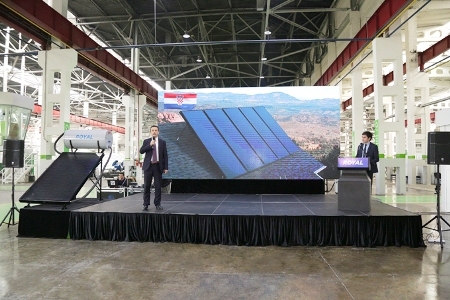 The ceremony had been attended by representatives from the Ministry of Finance, the State Committee for Architecture and Construction, government-owned National Energy Saving Company and several media outlets. Solimpeks entered into partnership with Artel in 2016 to plan the layout of the factory, select the machines and design some new equipment. “We’ve set up the factory and trained manufacturing staff,” explained Kececiler. Royal-brand solar collectors are produced according to European standards EN 12975 and EN ISO 9806. The next step will be to advise Artel’s sales and engineering team on the design, installation and maintenance of solar thermal systems differing in size and functionality. The collector and tank factory went into operation shortly after Uzbekistan’s government had approved the PP-3379 regulations, Measures to ensure the cost-effective use of energy resources in Uzbekistan, on 8 November 2017. Paragraph 2b of the new rules stipulates that starting in 1 January 2022, public buildings and facilities must have energy-saving interior lights and certified solar thermal systems for hot water supply installed. Artel Group, a fairly young business, was founded in 2011. It specialises in the manufacture of home appliances offered under several brand names.